Hey hey! I'm back today with another fun "Look for Less" post. Today's goal? Source the fabulous finds in this Kathryn Ireland bedroom (via House Beautiful) on the cheap. Kathryn, whom I'm clearly on a first name basis with because I watch Million Dollar Decorators, loves to use intense colors and patterns in her decor. She's all about layering the textiles, which I adore. With that said, I focused on sourcing mainly the fabrics, patterns and colors in this design. And I think I did a pretty good job finding similar items priced for the regular peeps. Yeah, baby. Honestly, I would never have pulled together these colors and layered patterns on my own, but I absolutely love it. There's something sweet about mixing the buttercup yellow and floral prints with the bright pops of red and rough textures of the jute rug and wooden furniture. That Kathryn knows what she's doing, I tell ya! What do you think? Would you pair these finds together? I wouldn't have thought to mix them together either but the end result is beautiful! I love your version too! Love Kathryn (saw her at dinner last week actually...didn't meet her, but still! :)) Your look for less is great. The lamp shade is awesome! Great post! 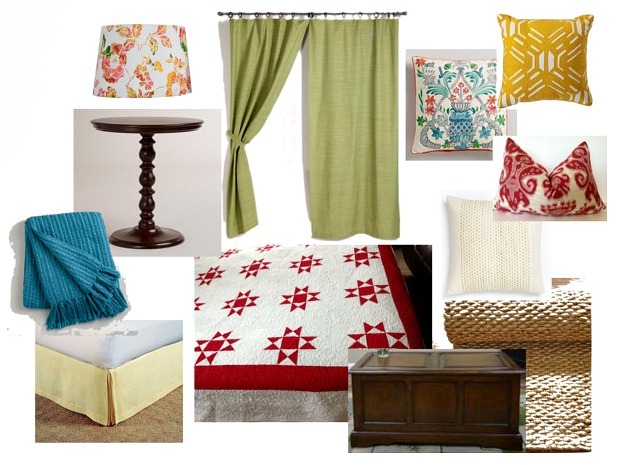 I would love to have you link up for the Mood Board Link Party I host on Tuesday's - www.designyourdwelling.blogspot.com! This looks great. I love red and white quilts but I wood have never added the other layers. I got a very similar quilt at JCPenney, too, probably around $100, and I love it. I'm with you, Michelle! I wouldn't have thought to do it on my own, but I love this space! So cheery... thanks for sharing!